The truth is, this journey called strength doesn’t have a finish line. It is a long, exciting, frustrating, rewarding, soul-testing, tough, motivating journey that has no end in sight. I have no final destination to reach. I simply have a map and compass to guide me along the journey. There are points plotted out along the way I must get to, and I have a training philosophy that will guide me, but that’s about it. To me, my 315 deadlift was just another point on the map I needed to reach. Similarly, a long time ago a 225 pound deadlift was just another destination on the map I needed to get to. And 405 is just another destination on my journey. Admittedly, I may take a few detours along the way to my 405 destination. I may train specifically for fat loss, focus on building some muscle, learn a new lift, or bring up a weak lift or body part for a period of time, among other options. 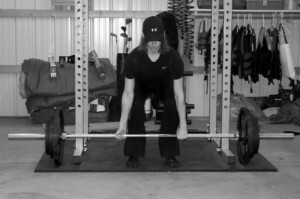 But one of my most important destinations to reach on this strength journey is pulling a 405 deadlift. Some other destinations may be planned for along the way, but the 405 is one I must get to at some point. It never ends. Goals may change along the way, there may be some detours and unforeseen obstacles I come across, but the journey itself never comes to an end. That is the vision most people fail to see – the journey should never end. They just tell themselves, “All I have to do is reach my goal weight and I’ll be happy,” or something similar with a strength training goal. So, they reach their goal (maybe) and then they just stop. Inevitably they fall back into old habits and look and feel the same as they did before their “journey” began. For them it was a trip that had a definite end; it wasn’t a lifelong journey. Now I can’t say for sure that I’ll be deadlifting hard and heavy when I’m in my 60s and beyond. Right now I don’t possess the ability to see into the future, so I don’t know what’s in store for me. Who knows, maybe I’ll pick up that super power on my journey. If I have it my way, I’ll be training in some way or another forever. At this point I know this – right now my ultimate goal is to deadlift 405. But I know I’ll have to visit 345, 365, and other “land marks” along the way to my main goal of 405. However, once I do pull 405, it will not be the end. I have other destinations I must visit on this journey called strength.